How conservative is too conservative? In the Texas Legislature, movement and establishment Republicans have fought for years over what constitutes an ideal conservative — and don’t expect that to end this session. 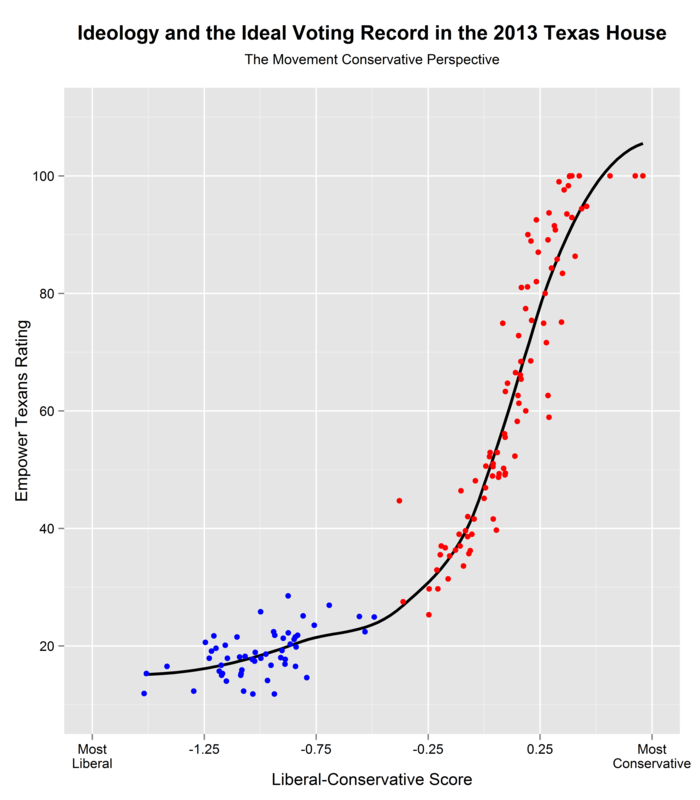 Analysis suggests that for movement conservatives, the more conservative the better, and there’s no such thing as too far to the right. For establishment conservatives, the ideological sweet spot is in the center-right of the spectrum, and there is such a thing as too far to the right. At the end of every legislative session, the state’s most prominent movement-conservative interest group, Empower Texans/Texans for Fiscal Responsibility, and the most prominent establishment-conservative interest group, the Texas Association of Business (TAB), score the members of the Texas House and Senate. For both groups, a rating of 100 represents a perfect legislative record. I’ve explored the relationship between those groups’ ratings for the 2013 legislative session and House members’ 2013 Liberal-Conservative Score (Lib-Con Score). Unlike the Empower Texans and TAB ratings, which are based on a select number of roll call votes and other legislative acts handpicked by the two groups, the independent and ideologically neutral Lib-Con Score includes all non-lopsided roll call votes cast by the representatives in 2013. In the two figures below, every representative’s interest group rating is plotted against his or her Lib-Con Score. In each figure, a black trend line (a LOESS curve) charts the relationship between the respective rating and the Lib-Con Score from the most liberal (left) to most conservative (right) ends of the scale. 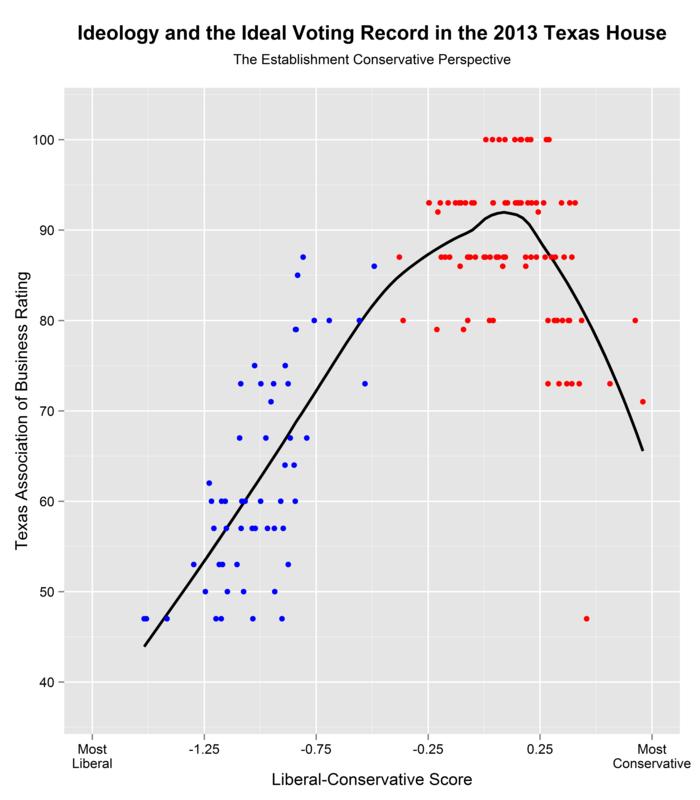 The figures underscore the extent to which movement conservatives and establishment conservatives view the same legislative behavior through very different political lenses. From the movement conservative perspective (as seen through the eyes of Empower Texans), the more conservative a Republican representative’s Lib-Con Score, the more positively he or she is viewed. Among Republicans, the black trend line in the figure rises at a very steep linear angle once a representative’s Lib-Con Score passes to the right of -0.25. 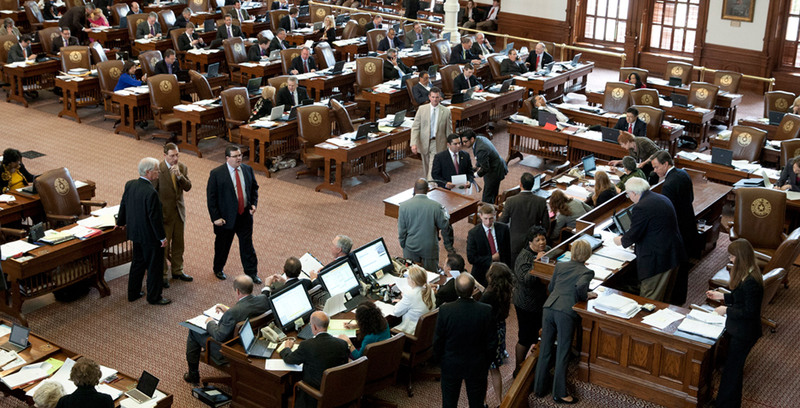 For movement conservatives, there are crystal clear contrasts within the GOP delegation, and within the current ideological boundaries of the Texas House, there is no penalty assessed for representatives at the far conservative edge of the ideological spectrum — quite the contrary. The clarity in the ratings of Republicans is not found on the other side of the aisle. From the point of view of movement conservatives, House Democrats are a liberal blur, with Democrats who possess the more liberal Lib-Con Scores on average rated only slightly lower than Democrats who have significantly more conservative Lib-Con Scores. This cloudy image is reflected in the very gradual positive slope of the trend line within the Democratic delegation. And with two exceptions, every Democratic representative received a lower rating from Empower Texans than all Republicans. In other words, every Republican was closer to the group’s legislative ideal than every Democrat, unless that Republican was John Zerwas of Richmond or J.D. Sheffield of Gatesville. 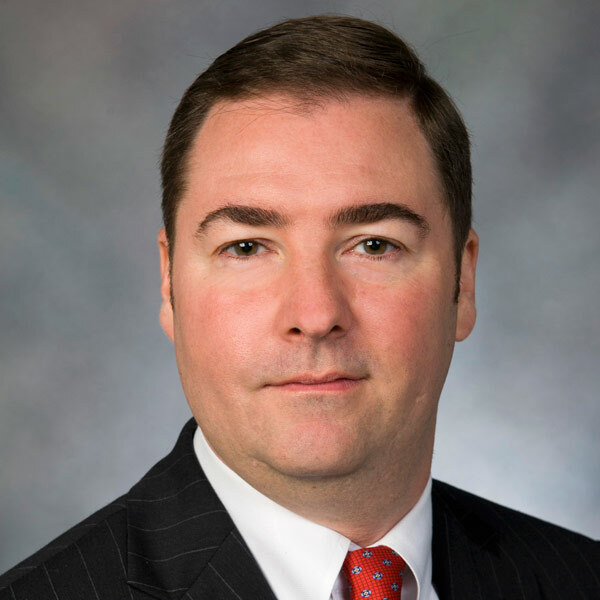 The establishment conservative vision (as seen through the eyes of the Texas Association of Business) of the Texas House differs in important respects from the movement conservative vision. Most importantly, the overall relationship between a representative’s TAB rating and his or her Lib-Con Score is curvilinear, not linear. Moving from the left (most liberal) to the right (most conservative) on the Lib-Con Score scale, the trend line’s rise is linear until it moves out of the Democratic space into the Republican side of the ideological spectrum. At this point the trend line begins to gradually reduce its angle of ascent before reaching a peak that represents the location of the optimal conservative. Until the peak, on average, the higher a representative’s Lib-Con Score, the higher the TAB rating. After reaching this summit, however, the trend line begins to slope downward, with a higher Lib-Con Score from this point onward on average associated with a lower TAB rating. For establishment conservatives, representatives found on the eastern slope of this ideological mountain have crossed the line from ideal conservative territory into “too conservative” terrain. Reflective of this curvilinear relationship, the Republicans with the most conservative Lib-Con Scores are rated by the TAB as roughly on par with the Democrats with the most conservative Lib-Con Scores. The average TAB rating for the dozen Republicans with the highest (most conservative) Lib-Con Scores is 78, while the average rating for the dozen Democrats with the highest (most conservative) Lib-Con Scores is 77. Unlike the case with movement conservatives, who view Democrats as an amorphous blob of liberals, for establishment conservatives there is a sharp differentiation among Democrats. The significant linear trend line on the Democratic side of the political spectrum signals the strong positive relationship between the TAB rating and the Lib-Con Score among Democrats: The more conservative a Democrat’s Lib-Con Score, the higher the TAB rating, and the more liberal a Democrat’s Lib-Con Score, the lower the TAB rating. For instance, state Reps. Richard Peña Raymond, D-Laredo; Ryan Guillen, D-Rio Grande City; and Oscar Longoria, D-Mission, all earned TAB ratings higher than those of more than 20 Republicans, including nine of the 12 Republicans with the most conservative Lib-Con Scores. By comparison, the top-rated Democrat by Empower Texans had a higher rating than only two Republicans, representatives who had the GOP’s second and third least conservative Lib-Con Scores. Movement conservatives and establishment conservatives view the policy and political world from different angles. As a result, what establishment conservatives often perceive as a flawless policy agenda is simultaneously seen by movement conservatives as a primrose path to disaster, and vice versa. At the same time, there’s considerable common policy ground between movement and establishment conservatives and more opportunities for consensus than for conflict. After all, it’s not as if movement conservatives are from Mars and establishment conservatives from Venus, but rather merely from Big Spring and from Lufkin. Disclosure: Rice University and the Texas Association of Business are corporate sponsors of The Texas Tribune. A complete list of Tribune donors and sponsors can be viewed here.